New Horizons provides the highest resolution image of Pluto ever seen as presented in a NASA press conference on July 15, 2015, at the Johns Hopkins University Applied Physics Laboratory, Laurel, Maryland. LAUREL, Maryland — After 85 years as a mystery, the surface of Pluto is finally coming into focus, with a new NASA photo revealing towering ice mountains rising from its surprisingly youthful face. NASA today unveiled the first close-up photos of Pluto and two of its five moons as seen by the New Horizons spacecraft, which buzzed the dwarf planet Tuesday (July 14) during a historic flyby. One photo revealed a mountain range rising 11,000 feet (3,500 meters) into Pluto's sky, along with a surface just 100 million years old at the most. "I don't think any of us could have imagined that it was this good of a toy store," New Horizons principal investigator Alan Stern, of the Southwest Research Institute (SwRI) in Boulder, Colorado, said in a press conference today (July 15) unveiling the images. The scene was "something close to bedlam" in New Horizons' mission control center here as the team waited excitedly for the images to come down, Stern added. New Horizons made history on Tuesday when it flew past Pluto, coming within 7,800 miles (12,553 kilometers) of the dwarf planet and recording images and data all the way. In the days and weeks leading up to the close encounter, the probe had already revealed tantalizing features on Pluto, including: a polar ice cap; a stunning heart-shaped feature that spawned an "I [heart] Pluto" meme online; and strange dark spots that the team gave nicknames like Cthulhu, Balrog and other underworld-themed monikers. But the images released today were what the science team, and the public, had been waiting for: the first close-up views of the Pluto system. "Who'd have supposed that there were ice mountains?" said project scientist Hal Weaver, of the Johns Hopkins University Applied Physics Laboratory here. "It's just blowing my mind." Just as surprising as the ice mountains was the terrain around them, said John Spencer of SwRI, deputy lead of the mission's geology and geophysics investigation team. "The most striking thing about this image is, we have not yet found a single impact crater on this region," Spencer said, adding that the smooth terrain suggests it is much younger than the 4.5-billion-year-old solar system. "We're just eyeballing it, but we think that it probably has to be less than 100 million years old." New Horizons provides unprecedented details of Pluto's moon, Charon, as presented in a NASA press conference on July 15, 2015, at the Johns Hopkins University Applied Physics Laboratory, Laurel, Maryland. The new photos are just a taste of what Stern calls a "waterfall of data" from New Horizon's epic flyby. The spacecraft will spend the next 16 months beaming high-resolution photos and other data from its instruments to Earth. Those observations, scientists say, will completely transform what is currently known about Pluto. The first clear view of Pluto's big moon Charon revealed tantalizing details, including evidence that the moon has been geologically active relatively recently. Vast cliffs and troughs cut lines that run 600 miles (960 kilometers) across the moon's surface. At least two big canyons, one up to 6 miles (10 km) deep, have been spotted. "Charon just blew our socks off," said mission deputy project scientist Cathy Olkin, also of SwRI. "We have just been thrilled." For the first time, New Horizons revealed the shape and size of Pluto's moon, Hydra, as presented in a NASA press conference on July 15, 2015, at the Johns Hopkins University Applied Physics Laboratory, Laurel, Maryland. A photo of Pluto's tiny moon Hydra — one of four satellites discovered just in the last decade — revealed it to be a strange, oblong object made up mostly of water ice. Hydra is about 27 miles long by 20 miles wide (43 by 33 km), the image shows. The first close images of the other small moons — called Styx, Nix and Kerberos — are expected to be beamed back to Earth in the coming days and weeks. "This is what we came for," said Lowell Observatory astronomer William Grundy, who leads the mission's composition team and unveiled a map of methane ice on Pluto as recorded by New Horizons. "This exceeds what we came for," Olkin quipped. 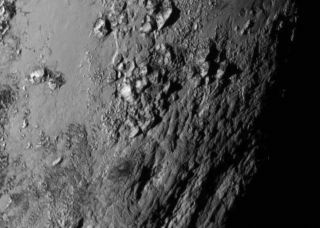 The sheer wealth of diverse formations on Pluto wowed NASA and New Horizons scientists. And the dwarf planet's color surprised some as well. "This is a reddish object," Jim Green, NASA's director for planetary science, told reporters today. "It's my other red planet." The $723 million New Horizons mission launched on its solar system trek on Jan. 19, 2006. It took more than nine years to reach Pluto and is now streaking out through the Kuiper Belt, the realm of icy objects beyond Neptune's orbit. Because Pluto is about 3 billion miles (4.8 billion km) from Earth, it takes New Horizons 4.5 hours to send images and data home to the science team. The scientists plan to spend Thursday (July 16) downloading more images and data. They expect to unveil the next batch of Pluto images and data on Friday (July 17) during a press conference at 1 p.m. EDT (1700 GMT). Visit Space.com Friday for live coverage of that Pluto image press conference.